Owner of the "Boulder Go Club", the club for the players of Boulder county (in CO). 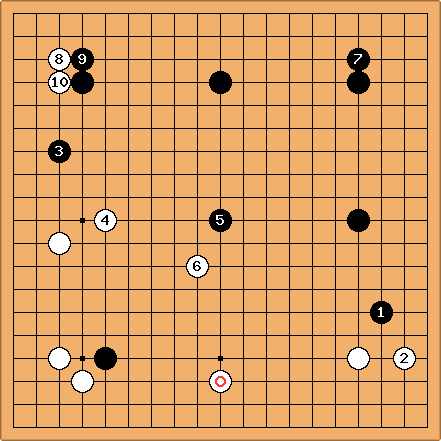 Fundamentals of Go by Kageyama Toshiro. I will start posting info on my study in Griffin's Study Log. Here are some problems. I will add others over time. Here is an ongoing game. If you want to play,please enter your name as white. Only one player as white and only one as black(I am black) please. Komi 6.5. Spectrums: Could this be a teaching game? griffin: There can't be 2 s,i have changed your move to . griffin: Sorry,I corrected your move (changed it to 6) but didn't play:). 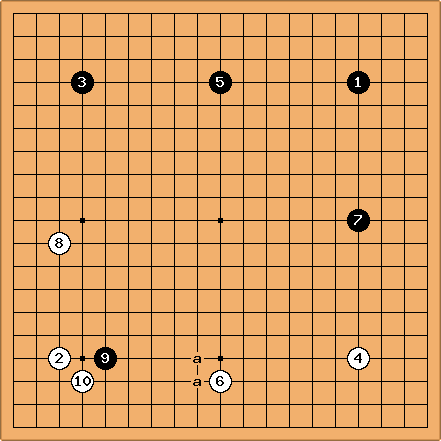 griffin: Move 8: should be one point higher.It could also be a corner enclosure(shimari). griffin: I don't know if you are right about the chinese fuseki although it sounds reasonable but I agree with you that 6 was not a very good move. Bill: Brief comment. White's play is not very enterprising. Every White play from ( in this diagram) to here can be criticized for that. White has already fallen behind, as a glance at the board indicates. Spectrums: That's why its a teaching game :D Thanks for your imput. Griffin: Spectrums! You are white,not black :). griffin: Instead of 4, cut to the right of 1, I connect, W 5, black blocks to the right of it, white connects, black connects at a, white connects above 2, balck plays b.